SHED LETTERPRESS is an independent letterpress studio located in Durham, North Carolina. We run a 1954 Heidelberg Windmill letterpress and specialize in reasonably-priced, high quality letterpress for a variety of clients. From brides to banks, to short-run artist prints, we’re happy to crank out some tactile letterpress goodness for you. From the velvet nap of our tree-free papers to the distinct imprint of the type, Shed Letterpress creates sophisticated keepsakes that immediately announce their handcrafted character. Each piece of paper, each color, each run of the press is singular, culminating in an elegant, yet highly individual item. At Shed, we are committed to keeping things small, handcrafted, and personal, and we strive to create an environment where all of our clients and designers feel like friends. 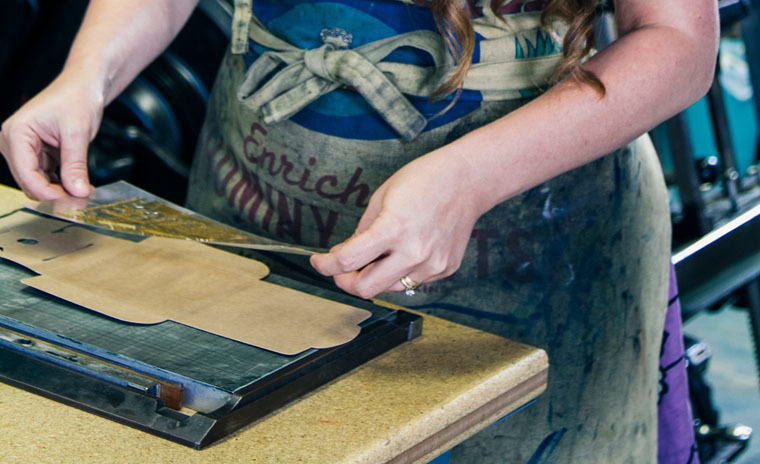 We offer in-house letterpress printing, foil stamping, edge painting, and die-cutting, and are happy to project manage pieces requiring multiple processes, such as digital and letterpress printing, or letterpress and binding services. We offer in-house letterpress printing, foil stamping, edge painting, and die-cutting on a 1954 10x15" Heidelberg Windmill. Owner Sarah Almond was trained at venerable NYC print shop Press NYC, and has printed for clients such as Versace, Isaac Mizrahi, and the New York City Ballet. Our standard for quality is impeccable, and we aim to do the same for the environment. All of our packaging is recycled or made from post-consumer waste materials. We recycle all of our plate material and paper overage as well, in addition to using low-VOC solvents and rubber-based inks.